Like I said, when we were planning Italy we made the conscious decision to splash out on the Waldorf Astoria in Rome, to the point where we scrimped a little in other places. 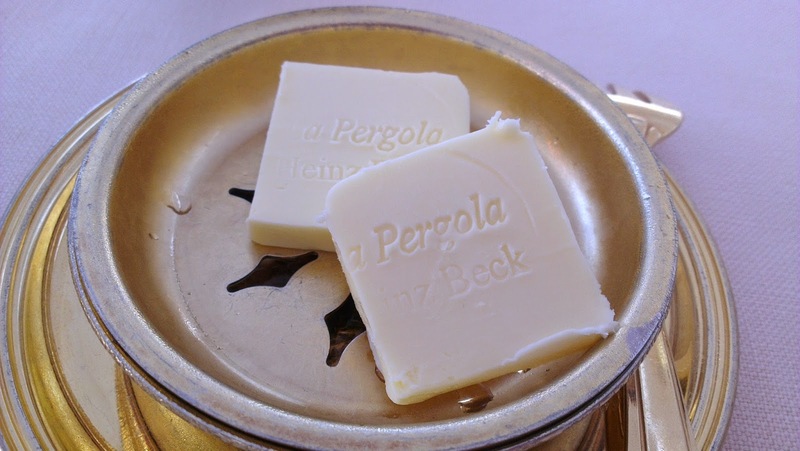 After a bit of back and forth on the subject, we decided to go to La Pergola for dinner on my birthday. 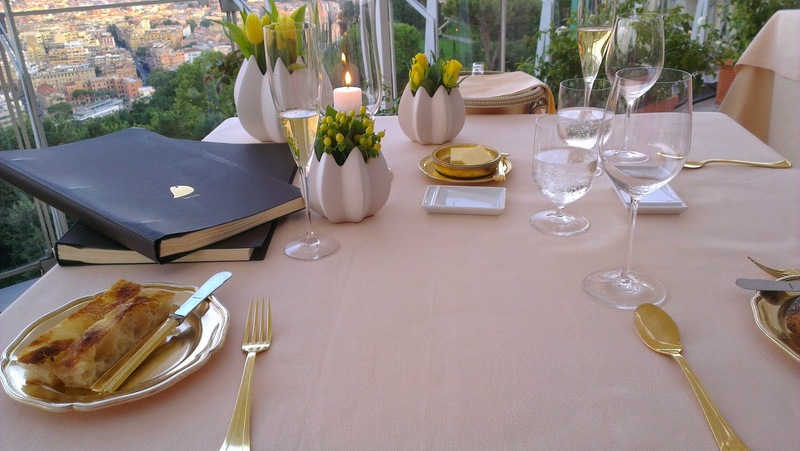 This is the three-Michelin-starred restaurant on the roof of Il Cavalieri, with panoramic views of the city. I can't even begin to put this into competent prose so I'm just going to blurt out everything I can remember in bullet points. Every time we got up for any reason, a waiter would silently appear and refold the napkins. We both had our napkins replaced during the meal at some point. They brought me a special little table for my bag. The bread came on a trolley, with a man in white gloves, who asked what bread we'd like and then moved it to a golden plate with tongs, walked round the table and removed it to our side dish, again with tongs. The bread cart came back whenever our bread plates were empty. The bread was serve with monogrammed butter, but also with very good olive oil and a selection of salts, from the salt menu. We tried a local Italian salt, a pink salt from the Himalayas, and a spiced salt from Morocco. The aperitif was a choice of three sparkling wines, wheeled to the table in a huge copper bowlful of ice. This turned out to be complimentary - score! There were two wine lists - Italian, and rest of world - though they'd be better named wine books (see picture). The Sommelier managed to almost hide his disappointment when we ordered a bottle of white (Greco, which I'd read about in the hotel magazine) and said that perhaps we might try a glass of red later. Having recently got back into red wine after a long time avoiding it, I'm now quite sorry that I didn't take him up on this. We also had to choose a water, from a very extensive water menu. We did play with the wine waiter a bit by drinking up after he'd just walked past us. His sole job, it seemed, was to keep the glasses topped up. I started to get concerned that he might get into trouble if we kept playing this trick on him. I can't even talk about the food. It was just amazing. We had the tasting menu, but Tutt doesn't like fish and 6 of the 9 courses were fish; when she said this, they managed to rustle up a whole tasting menu of non-fish dishes. One of her dishes was a ravioli that had pork in it and some kind of consomme, so it was liquid when you bit into it. 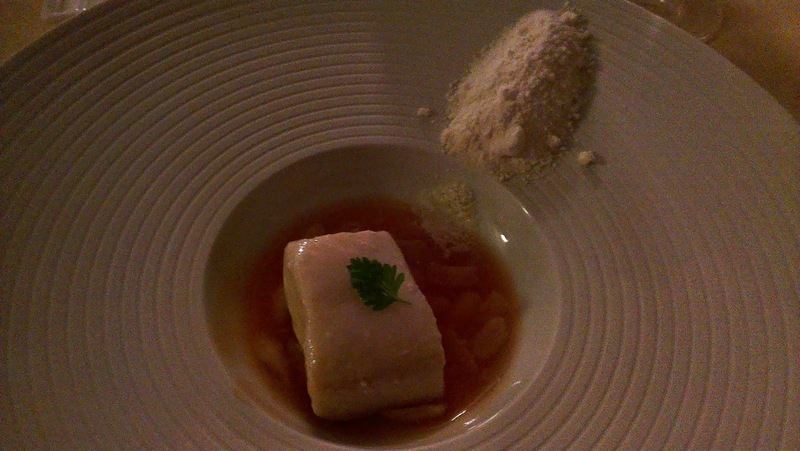 One of my dishes included cod snow. Another one of my dishes was called "The Sea". It was served in a dish which had a small alcove in it, on which was a green cube. At a given signal, a waiter whisked in and poured some kind of thin soup over the cube, which instantly dissolved to produce the very smell of the sea. Amazing. Like theatre. There was a cheese trolley. I ate pecorino with strawberry jam. This is an astonishingly good combination. When it came to dessert, we counted 22 separate desserts. I'm not joking. There was the pre-dessert dessert, which was ice cream; then a selection of hot desserts, and a selection of cold desserts, and this awesome silver box which had two tiny cakes in every drawer. 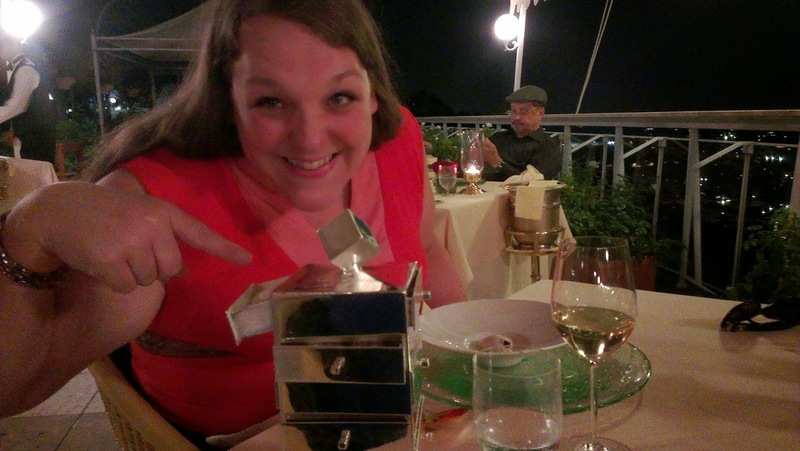 The waiter told us these silver boxes are handmade for them in Venice to a prototype they drew up, out of something like 4lbs of silver. It's called the Box of Delights. It was delightful. Just when we thought the desserts were over, they came out with one last thing - a big piece of cake with a candle in it, for my birthday. The waiter asked if he could take a picture on his camera, which seemed a bit odd but we allowed it. 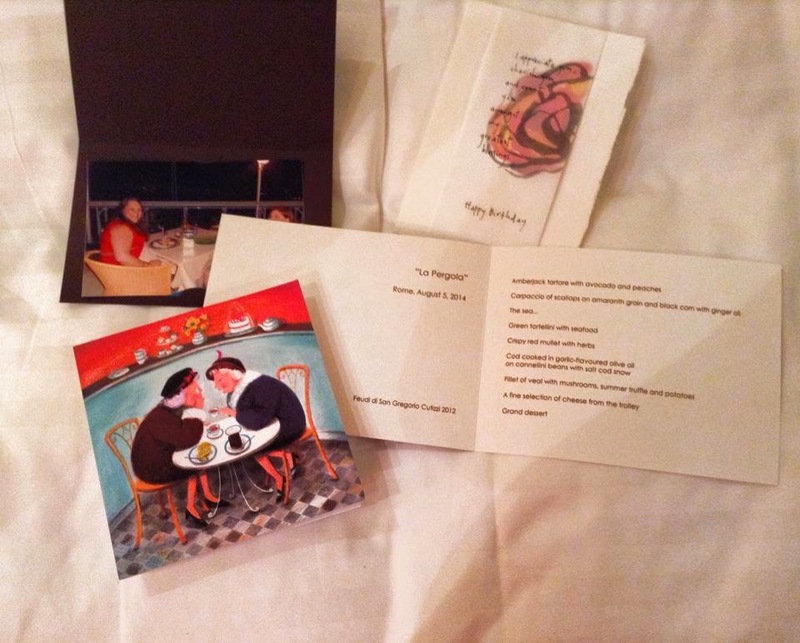 I blew out the candle, the cake was cut in half and served to us, and then the waiter was back - the printed out photograph in a commemorative card. Just, wow. The toilets had an odd thing for napkins, where you had to pull one up and it was joined to this frame on a ring, so that after you'd dried your hands it went straight into the basket. Unusual but memorable. One my way to the toilet I saw a young gentleman in sweats, clutching a plastic bag, trying to talk the very polite hostess to let him in just for dessert. She was not having any of it. Apart from her, all the other staff were male. We got there first and were almost the last to leave: this epic meal took us about five hours to eat and we staggered back to the room, uncomfortably full. We got to meet Heinz Black, the famous chef, who came out to meet the few remaining diners at the end of service. The American couple on the table next to us were absolutely raving about how eating there was fulfilling a lifelong dream, which made me realise - it's probably a bit more famous than we knew when we booked it. When he came to us I asked him what his favourite place in Rome was, and he said the Pantheon, although Rome in the spring is beautiful when the rose garden is in bloom. As a result of this, I went to the Pantheon on the last day. I think that's just about everything. I couldn't have asked for a better birthday meal! It did involve quite a lot of advance planning and saving, but it was totally worth it.